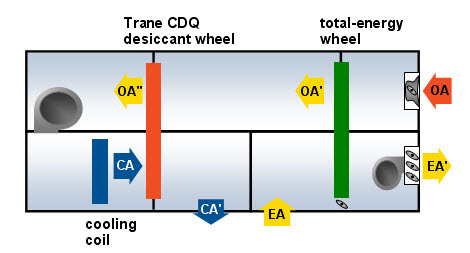 I am trying to model a regen desiccant wheel (Trane CDQ shown below) in a DOAS using openstudio. The dessicant wheel dehumidifies and reheats the supply air after the cooling coil. Has anyone been able to model this or have a workaround that they have used? @edixon16 Have you been able to model a desiccant heat exchanger that uses the same air stream on both the regeneration and process side in Energyplus (Trane CDQ)? When I tried to do what has been suggested in this question, I have problems specifying the inlet/outlet nodes of regeneration and process air in the HeatExchanger:Desiccant:BalancedFlow object. Apparently, Energyplus does not allow to specify the same air stream for regeneration and process sides. Any help on how to solve this issue would be greatly appreciated. I just modeled it in Trace 700. To model this in OpenStudio, you will eventually need to include a desiccant heat exchanger object, either the HeatExchanger:Desiccant:BalancedFlow or HeatExchanger:Desiccant:BalancedFlow:PerformanceDataType1. However, this type of heat exchanger is only available in the OpenStudio API and not the interface, so you would have to write a measure to incorporate it. The tricky thing is that you want to use the same air stream on both the regeneration and process side. You may want to test this in an example file that uses a desiccant HX object like "DesiccantDehumidifierWithCompanionCoil.idf" to see if EnergyPlus will allow that. If EnergyPlus doesn't natively allow that, you will need to examine how to apply EnergyPlus Energy Management System objects instead as a workaround. Below is an image of what OpenStudio and EnergyPlus typically allow for configuration of outdoor air system components on the left, as well as what you want to model on the right. You may also want to check a similar question posted by @Annie Marston to get some other ideas. Hi Aaron, I am recently working on a project that needs this deciccant wheel, and I found this "HeatExchanger:Desiccant:BalancedFlow" is NOT available in OpenStudioAPI. The link you have above is the idd field object. Thanks for your diagram though. how to build EnergyPlus IDF file in Google SketchUp? Is it possible to submeter a single building of a multiple building model?